There isn’t a Fenerbahce stadium tour therefore the only way to see the stadium is during the Fenerbahce matchday experience. On the other hand you could always ask security to give you a private stadium tour on non match days. However, there is a Fenerbahce museum. 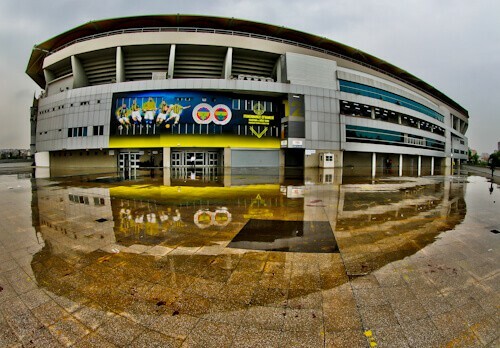 The Fenerbahce stadium is officially known as the Sukru Saracoglu Stadium, however due to sponsorship reasons it’s now called the Ulker Stadium. The stadium is located on the Asian side of Istanbul in the Karakoy district. It has a capacity of over 47,000 making it the 3rd largest stadium in Istanbul as well as the 4th largest in Turkey. The most famous match played here was the 2009 UEFA Cup final, which was the last ever UEFA Cup. Another famous match played here was a Fenerbahce Galatasaray derby when Graeme Souness planted the Galatasaray flag in the center circle after victory. If you take the Galatasaray Stadium Tour, you may watch a video of Graeme Souness placing the flag as well as see the actual flag. You’ll probably be staying in the European side of Istanbul but it’s very easy to get to the stadium on the Asian side. 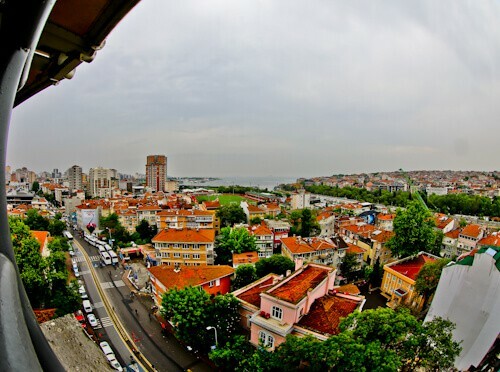 Most tourists choose Istanbul Hotels on the European side which have access to the Marmaray metro line. To get to Fenerbahce stadium, take the Marmaray line to the last stop which is Ayrılık Cesmesi. From Ayrılık Cesmesi it’s a 20 minute walk to the stadium. It’s possible to take a bus to the stadium but with all the people and traffic, it’s easier to walk. You’ll pass lots of quirky cafes and restaurants on this 20 minute walk, you can take advantage of these and fill up before the match. Using the public transport in Istanbul is easy, just buy an Istanbulkart and keep topping it up at the automatic machines. 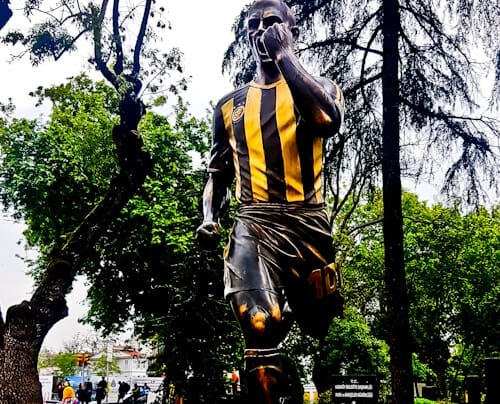 As you arrive at the stadium you’ll pass a statue of Fenerbahce hero, Alex de Souza. Alex de Souza is a Brazilian footballer and former Fenerbahce captain. He scored over 100 goals for Fenerbahce, in addition he scored the 3000th Fenerbahce goal in the Turkish league. The boots he was wearing when he scored the 3000th goal can be viewed in the Fenerbahce museum. Regrettably, you cannot just turn up at a football stadium, buy a ticket and watch a match. Firstly, you must buy a Passolig card and secondly buy a ticket online. Your Passolig card will likely be delivered to a pick up point at one of the stadiums but it’s unlikely you’ll have time to pick it up – if indeed the pick up point is open. Thankfully you can pick up your tickets without a Passolig card as they will give you a one time use card (above). Furthermore, arrive at the stadium early as there will be a queue to pick up tickets! 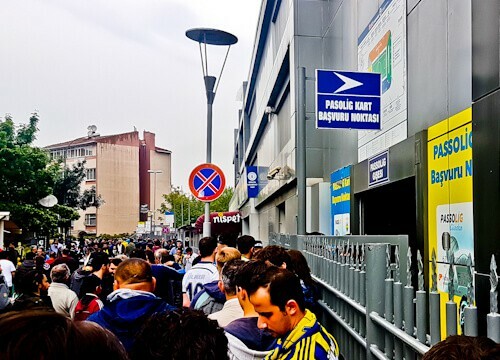 You must first buy a Passolig card before you can buy a ticket to a Turkish football match. The Passolig card can be bought online from the Passo website. 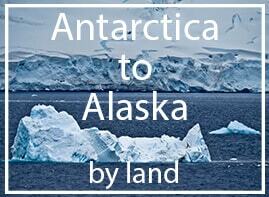 You will need your passport number and a working cell phone number to apply, in addition the fee is around €8. It takes less than a minute to buy the Passolig card, once paid for you can log in to the Passo ticket site and select the game as well as the seat you wish. I recommend sitting along the sides of the stadium as the fans are a little calmer in these areas. It’s possible you will have difficulty buying a Passolig card, maybe you don’t have a credit card or working cell phone. At the front of the line at the stadium will be an unofficial ticket salesman. He will add a few Euros onto the price of the ticket and set you up with a one time Passolig card. 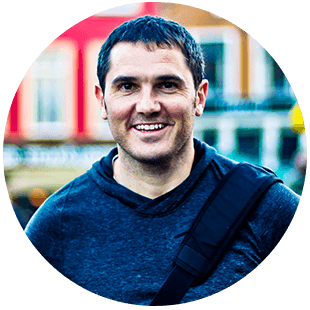 This method actually saves you the hassle of buying your own card as well as pushing to the front of the line. Importantly, the one time Passolig card doesn’t have any information about the seat number, so make sure you know at least which area of the stadium you will be located in. In conclusion, the whole Passolig card system is a flawed system. 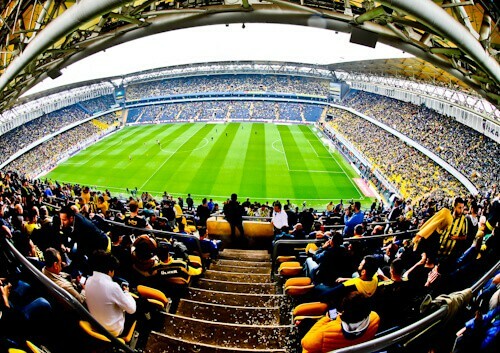 The Sukru Saracoglu Stadium is said to have one of the best atmospheres of any stadium in the world. This is a good reason to choose a Fenerbahce matchday experience whilst in Istanbul. When I visited they were playing a lower team but the stadium was almost full and the atmosphere, electric. Where I was sitting, the fans were reasonably calm, but at either end of the stadium things can get quite rowdy. Surprisingly, the Fenerbahce stadium has a good view of the Bosphorus. The best view is from the top of Fenerium stand. I recommend choosing this stand to watch the game because the fans are relatively calm, you are behind the coaches, additionally you can walk to the top and enjoy this view at half time. During the game Fenerbahce were disappointing and were in fact losing 1-0 until late in the game. They were lucky to win, they equalized before Bursaspor had 2 players sent off, for this reason they scored a second goal and won the match. The atmosphere in the stadium was more exciting than the actual match. There was a Bursaspor player who was badly injured during the match. In fact he was so badly injured that he had to be taken off on a stretcher. Don’t worry though, a miracle happened when he reached the touchline. This player made a miraculous recovery and played the rest of the match! Of course the Fenerbahce fans booed him the whole time. 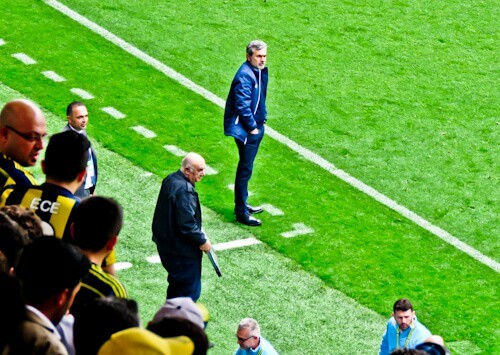 One of the best parts of the Fenerbahce matchday experience is watching the coaches. As coaches do all over the world, they get very animated during the match. In addition you can see the players warming up and any arguments that may happen. The away fans are tucked up in a corner of the stadium where they have least impact vocally. 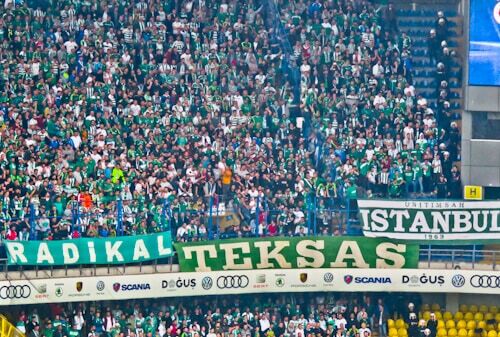 The Bursaspor fans did still make quite a noise, especially when they scored the first goal. Furthermore the away fans are surrounded by security the whole time, which is for their safety from the Fenerbahce fans. If there was a Fenerbahce stadium tour, you would get to see the dressing rooms as well as the trophy rooms. What you would not see is how the cameras operate during the match in addition to the security involved in controlling such a passionate set of supporters. Furthermore, the incredible atmosphere this stadium creates is a once in a lifetime experience. One of the fiercest derbies in world football is the Fenerbahce Galatasaray derby. If you’re lucky enough to get a ticket for this game, it will be the ultimate Fenerbahce matchday experience. 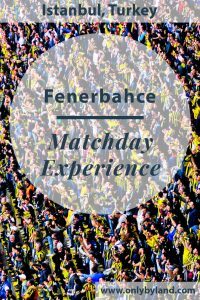 Fenerbahce Matchday Experience – Enjoy the match! Try to organise your tickets in advance with the Passolig system and arrive at the stadium 3-4 hours early to pick up your tickets. If that’s not possible then look for someone offering tickets near the Passolig booth. The best thing about the Fenerbahce matchday experience is the stadium atmosphere – you won’t be disappointed. Enjoy the game! Check out the Napoli Matchday Experience. 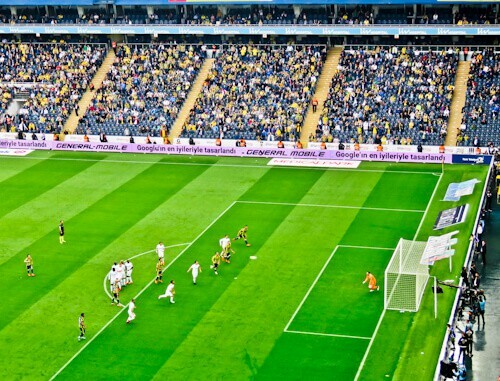 I’d love to see a live match at the fenerbache stadium! I can’t imagine how the atmosphere is! 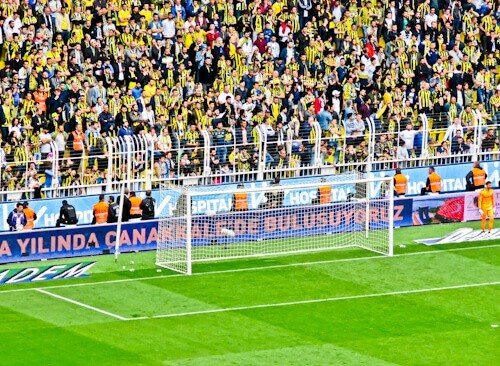 Fenerbache Galatasary derby would be incredible! Hi Usten, thanks for the official capacity. The atmosphere was amazing at the game, one of the best matchday experiences! I will contact you for sure next time I’m in Istanbul. I remember watching a video in the Galatasaray museum of Graeme Souness planting the Galatasaray flag in the center circle here!